This reminds me of something Jesus said. And he said: "Truly I tell you, unless you change and become like little children, you will never enter the kingdom of heaven." (Matthew 18:3) To me when Jesus talks of the Kingdom of Heaven he is referring not to a location, or to our concepts of Paradise, but a state of consciousness. I feel he was telling us that unless we find our true innocence and purity within, free of self-concept and sense of ego, we will not fully enter into this higher state of consciousness. Some may say that as we get older we lose our innocence, but I think it becomes covered up by layers and layers of conditioning. But deep in our primordial being - this childlike innocence is always there. Joseph, thank you for your words here, and for your appreciation of the painting. Blommers was one of several artists of the 19th-century belonging to an art movement known as 'The Hague School'. Among others were the father-and-son artists Joseph en Isaac Israëls, Hendrik Willem Mesdag, Anton Mauve and George Hendrik Breitner. Thank you also for your reminder of Jesus' words to his disciples when they attempted to send the children away. I remember so well listening to this story as a child, although I seldom could see who was telling it - unless I actually stood up on the church pew, because the grown-ups would always sit in the front row! But once home, if I protested about this, my mother would simply say, "Still now, child!" 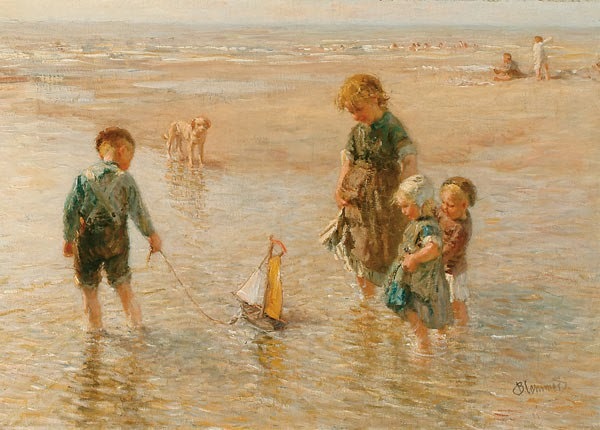 When we watch children playing at the shore, we are learning. For what they show us is not only joy, but trust, simple plain trust. They play as if there is no tomorrow and they are right without even knowing. Involved in this moment, not concerned with a yesterday or a tomorrow...they teach us about trust. Thank you Emma, your comments regarding trust is so beautifully expressed! Small children have an inner trust, a trust that is pure and not dependent upon a belief in this or that, but a "simple plain trust" as you described. And they do indeed teach us to live fully in the moment, without yesterday's regrets nor tomorrow's anxieties! So lovely and pure: innocence. Very beautiful painting and poem. Thanks for the beauty. Dank je wel, dear Sónia, for your kind words. I too am fond of this painting. And what a pleasant surprise to suddenly hear you speak Dutch! I wish I could read your blog in Portugese, but elas. The translation is pretty hopeless, so it's a real challenge to listen carefully to what you have to say. Yes it is true. The translator is very bad. We lost the true meaning in translation, mostly. It's a pity. I speak a little Dutch. Much less that my children, who speak correctly. They teach me sometimes (7 and 9 years old). We learn much more of a child than a child learns with us. Dear Sonia, yes, children are marvels when it comes to picking up foreign languages and it helps them to adapt to new situations. I would take heart and benefit from them. You are right about the translator. Subtleties and at times even the true meaning of poetry can so easily become lost in translation. But I feel nevertheless that we still manage to connect in a meaningful way.